The Pakistan tyre market reached a consumption volume of 20.9 Million Units in 2018, expanding at a CAGR of nearly 6.4% during 2011-2018. A tyre is a component fitted around the rim of a wheel in order to transfer the load of a vehicle from the axle to the ground. It can be made of various materials which include natural rubber, synthetic rubber, carbon black, fabric and wire along with other chemical compounds. The footprint of a tyre is designed so that the vehicle’s weight is in accordance with the bearing strength of the surface. Majority of the tyres are pneumatically inflated through which they offer a flexible cushion that absorbs shock when the tyre travels over a rough surface. With an increase in the vehicle motorisation rate in Pakistan, the demand for tyres has witnessed a positive surge in the recent years. The market for tyres is currently witnessing strong growth in Pakistan. There has been an increase in vehicle ownership as well as enhancements in road infrastructure across the country. In addition to this, the government has been focussing on infrastructural and macroeconomic reforms leading to a rapid rise in the industrial, construction and agriculture sectors. This will, in turn, catalyse the growth of the automotive industry of Pakistan. The Government has also implemented increased taxes on imports of tyres in order to promote and strengthen its domestic manufacturers which has further propelled the market growth. Moreover, on account of a consistent rise in the demand for tyres, local as well as foreign investors have started showing a keen interest in the tyre industry of Pakistan. 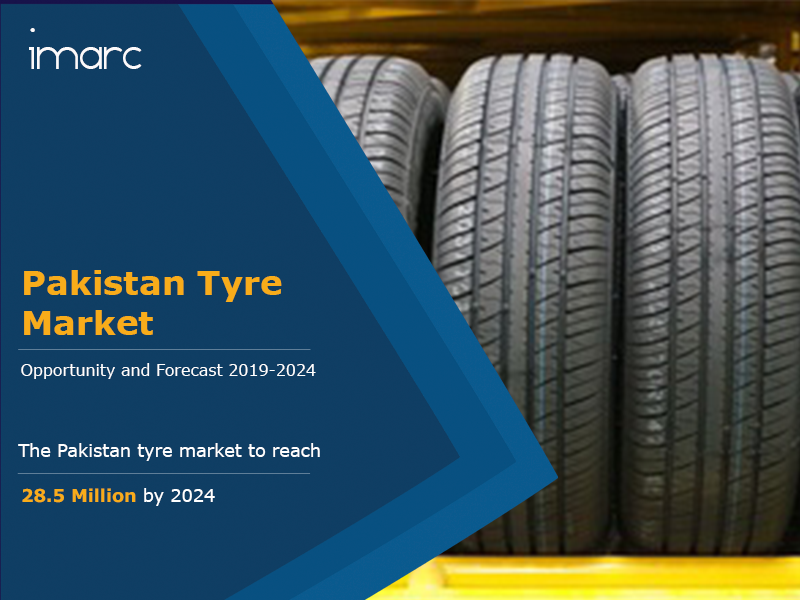 Looking forward, the tyre market in Pakistan is projected to reach 28.5 Million Units by 2024. Based on the vehicle type, the market has been segmented into two wheelers and three wheelers; passenger cars and light truck tyres; and heavy commercial and OTR tyres. Amongst these, two wheelers and three wheelers currently represent the largest segment. The report has analysed the production aspects of OEM and replacement tyres across the region. Currently, replacement tyres account for the majority of the total market. On the basis of domestic production vs imports, domestic production currently accounts for a higher share in the tyre industry of Pakistan. The Pakistan tyre market has also been segregated on the basis of legitimate and grey market with the legitimate market currently accounting for a higher share. Based on the tyre type, the market has been categorised into bias and radial. Radial tyres currently dominate the market. The market has also been segmented on the basis of tube and tubeless tyres. Tubeless tyres currently represent the biggest segment. On a geographical front, Punjab currently dominates the Pakistan tyre market accounting for the majority of the share. Some of the other major markets include Sindh, Khyber Pakhtunkhwa and Balochistan. How has the Pakistan tyre market performed so far and how will it perform in the coming years? What are the key regional markets in the Pakistan tyre industry? What is the breakup of the Pakistan tyre market on the basis of product type? What is the breakup of the Pakistan tyre market on the basis of application? What is the breakup of the Pakistan tyre market on the basis of vehicle type? What are the various stages in the value chain of the Pakistan tyre industry? What are the key driving factors and challenges in the Pakistan tyre industry? What is the structure of the Pakistan tyre industry and who are the key players? What is the degree of competition in the Pakistan tyre industry? What are the profit margins in the Pakistan tyre industry? What are the various unit operations involved in a tyre manufacturing plant? What is the total size of land required for setting up a tyre manufacturing plant? What are the machinery requirements for setting up a tyre manufacturing plant? What are the raw material requirements for setting up a tyre manufacturing plant? What are the packaging requirements for a tyre manufacturing plant? What are the transportation requirements for a tyre manufacturing plant? What are the utility requirements for setting up a tyre manufacturing plant? What are the manpower requirements for setting up a tyre manufacturing plant? What are the infrastructure costs for setting up a tyre manufacturing plant? What are the capital costs for setting up a tyre manufacturing plant? What are the operating costs for setting up a tyre manufacturing plant? What will be the income and expenditures for a tyre manufacturing plant? 20.2.1 General Tyre and Rubber Co. Ltd.